For seniors on a fixed income, healthy food is often the first foregone necessity when bills are due, healthcare expenses are looming, and money is tight. Many count on a monthly box of canned fruits and vegetables, milk, cereal, pasta, and peanut butter to meet their nutritional needs and help stretch their budget. Now, a new program aims to give seniors the opportunity to choose what food items they take home. Every month, over 9,000 low-income seniors in Minnesota receive a box of food through the Commodity Supplemental Food Program (CSFP), which helps individuals living on a fixed income to make ends meet. As a federally-funded program through the Nutrition Assistance Program for Seniors, each box contains a predetermined variety of shelf-stable, nutritious food items. With access to healthy food as a primary concern, many recipients have expressed that the pre-packaged box of food does not completely align with their dietary restrictions and preferences. Others have voiced that the boxes are too heavy and bulky to transport. CEAP and Second Harvest Heartland are working to address these needs with Client Choice, a pilot program that encourages eligible clients to “shop” from CEAP’s pantry of CSFP food items as an alternative to the standard prepackaged CSFP box. “As a choice-model food shelf, we believe people should be able to select the items they want regardless of the program,” said Stephanie Lehman, CEAP’s Director of Operations. Client Choice currently serves about 60 participants, and their numbers are expected to grow over the pilot program’s six-month timeline. The program’s mission is to minimize waste of food shelf items while promoting a means of personal choice for senior clients. Lehman also anticipates that the pantry’s offerings will increase client participation in the program’s early stages. “I hope people find the program to be more nourishing as they will have additional access to perishable food items such as produce, dairy, and lean meat,” she said. 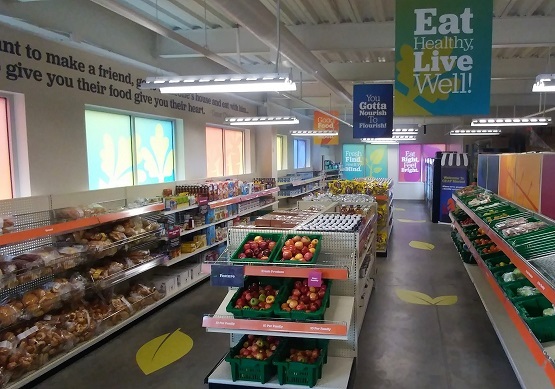 Once the pilot program is completed, Second Harvest Heartland plans to implement a choice-based CSFP model at other partner food shelves. Second Harvest Heartland is working on many fronts to improve access to healthy food for seniors, but there is more work to be done before we can say that no one around us worries about having enough food. Learn more about our CSFP program, sign up to volunteer or donate to help eliminate a barrier for someone who’s struggling.